The large cottage is located in the center of the beautiful small town and the resort town Daun, in close proximity to many attractions and destinations. 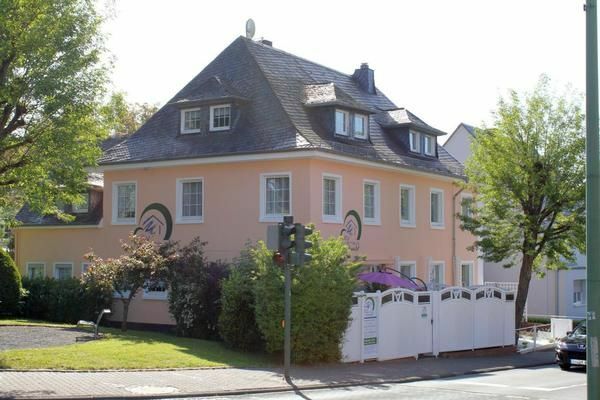 The City House Vulkaneifel is a combination of the two apartments "down" and "Vulkaneifel". Therefore, it can be booked as a complete house with 185 square meters and an outdoor terrace. In the vicinity of the house belongs a 45 sqm terrace with garden furniture. The terrace adjacent to the front of the busy street and the sidewalk and on the side of a small city park. Due to the central location of the house, the terrace has been enclosed with a fence and hedges. The separate entrance to the house leads from the street through the terrace into the house. Internet / Wi-Fi is available (flat rate € 2 per day incl. All spare equipment). You get when booking a corresponding code word for the WLAN. On exterior of the house has been lovingly created and consuming an ornamental gravel area. With fountains, a small waterfall. The house and the Außenalagen are in the evening and at night very attractive illuminated in a color match with LED spotlights. The house extends over 4 floors and can accommodate up to 14 people. It has 5 sep. Double bedrooms, a small additional apartment via a spiral staircase to the upper floor accessible, 3 bed-living rooms with 3 double sofa beds. Dining area in the lower region with vergrösserbarem dining table for all individuals; 2. Dining area in addition in the upper floor, 4 x HD TV in every living room and in the upper bathroom, 4 x DVD player, CD player, radio and USB port in 3 living rooms and in the 3 baths, Deckenventilaor, games etc. 2 kitchens, a thereof with dishwasher, 2 x bath and shower, 2 x WC (1 x upstairs and 1 x in the basement) and an additional shower room with wash basin (in the basement). Facilities include: 2 x microwave, coffee machines 4 (2 x pad, 2 x filter), 2 toaster and kettle 2. Pots and pans and cutlery and crockery for the highest possible number of people are naturally present. Cots and high chairs can be provided for free. Outside of the City holiday apartment Vulkaneifel is an approximately 45 square meter terrace with garden furniture. The walled with fence and hedges terrace located on the sunny side of the house and is adjacent to the front on the sidewalk and on the busy street. Side terrace adjoins a small city park. The house has 3 parking spaces. These are located in a garage, in front of the garage and a free parking space on the neighboring plot and can be used there for free. Many attractions and recreational facilities are within walking distance. Shopping, shopping, restaurants, cafes, cinema, Wellnesss or indoor warm water, etc. can be found right around the corner. A large supermarket and 3 bakeries (with Sunday trading) can be found only about 100 to 150 meters. The hiking area Wehrbüsch with connection to the lakes is only about 600 to 700 meters. A large children's playground is just 100 meters away. - Final cleaning: once per object costs in the amount of 100 EUR (compulsory). - Towels: to rent once per person for 9 EUR (compulsory). - Internet: costs per object and day in the amount of 2 EUR (compulsory). Internet (per property per day, included 2 EUR).